Abstract: The Central African Copperbelt of northern Zambia and southern Democratic Republic of Congo contains nearly half of the world’s cobalt resource and a significant fraction of its copper in Neoproterozoic sedimentary rocks. The Congolese people mined, smelted, and traded copper from exposed oxide deposits starting around the 6th century A.D., but the Western world only found out about the resource in 1892 through the travelogue of the Belgian explorer and geologist Jules Cornet. Geological research and economic exploitation have continued in the region since then. This presentation offers an overview of the history and present state of geological research in the Copperbelt. The Copperbelt host rocks are the Katangan Sequence, Neoproterozoic sedimentary rocks dominated by siliciclastics in Zambia and carbonates in the Congo. By the 1930s geologists recognized the Zambian and Congolese strata as part of the same system, but the first complete regional lithostratigraphic correlation between the two sides was only published in 1994. The facies interpretation had changed by then: in the early 1900s geologists thought the Katangan rocks were continental sediments, but the discovery of large-scale crossbeds, ripple marks, and mudcracks in the 1960s converted most geologists to belief in their nearshore-marine deposition. The recognition in the 1980s of relict evaporites throughout the Congolese and Zambian sides of the Copperbelt deepened the (interpreted) waters, and the Katangan strata are now generally accepted as the sediments of a restricted basin in an arid environment. However, their current mineralogical makeup is almost as much a result of alteration as of depositional facies: multiple pervasive episodes of hydrothermal alteration, recognized as early as 1914, modified the host rock mineralogy and introduced large volumes of Cu-Co and Cu-Fe sulfides. The details of the alteration mineralogy vary between deposits, and no one has yet presented a Copperbelt-wide study of alteration. It was obvious to the earliest Copperbelt geologists that the Katangan strata had been tectonically deformed. By the 1910s they had sorted the various structure types and orientations into categories corresponding to multiple episodes of folding, and by the 1930s the standard interpretation was that the Copperbelt rocks had been deformed by three different orogenies. Dating and other work in the late twentieth century has reduced this number to one, though modern geologists still sometimes subdivide this Lufilian orogeny (ca. 570-510 Ma) into two or three distinct episodes of deformation. Radiometric dating during the 1980s and afterward has shown that some of the alteration minerals, including some of the stratiform and all of the vein-hosted ores, formed during the Lufilian orogeny. The orogeny is interpreted as responsible for forming the vein- and breccia-hosted Pb-Zn-Cu-Au-Ag-U-REE-(PGE) deposits common in the upper Katangan stratigraphy. Its relationship to the stratiform Cu-Co deposits in the basal Katangan strata is much less clear and is one of the many subjects of historical and present debate in Copperbelt literature, with various authors attributing none some, or all of the stratiform ores to hydrothermal fluid flow accompanying the Lufilian orogeny. The relationship of stratiform to vein-hosted deposits is likewise in dispute. It has been discussed since the 1930s, remains unclear today, and probably will not be settled until the metallogenesis of the stratiform deposits is established. The metallogenesis of the stratiform Cu-Co ores is the most contentious issue in Copperbelt geology and has been for a century. Most of the earliest metallogenetic concepts were magmatic-hydrothermal, though Waldemar Lindgren dissented in favor of an amagmatic, epigenetic model in 1911. Subsequent hypotheses shifted from amagmatic (1910s) back to magmatic-hydrothermal (1930s-50s), then to syngenetic (1950s-1960s), then to diagenetic (1970s and thereafter). Modern ideas vary but are generally diagenetic or epigenetic, and many of them invoke multiple stages of mineralization. The number of these varies between one and five depending on the geologist, and estimates of the timing of mineralization ranges from nearly syngenetic (ca. 850 Ma) to late- or post-Lufilian (ca. 500 Ma). Every possible source has been suggested for the metals: meteorites, mafic intrusions, basement porphyry deposits, redbeds, and many others. Copperbelt geology has made great progress, but this and many other questions remain to be solved. But, as illustrated by the current consensus on amagmatic post-depositional metallogenesis of the stratiform deposits, a century of research and technological advancement has at least enabled the scholarly community of 2014 to reach the interpretation of Copperbelt mineralization that Lindgren formed in 1911. Bio: Isabel wanted to be a geologist at age 11, but was growing up on the Gulf Coast of Florida at the time, which made it difficult to find a rock, let alone a field site. So she headed for Norman, Oklahoma to get her B.S. in geology. There she took a sedimentology class from Lynn Soreghan, who suggested she apply to the University of Arizona for grad school. Isabel came to Arizona with two goals: to get an M.S. and then to get into industry. Six years later, her record at achieving those goals is a bit uneven: she has a Ph.D., but she still hasn't left academia for industry. 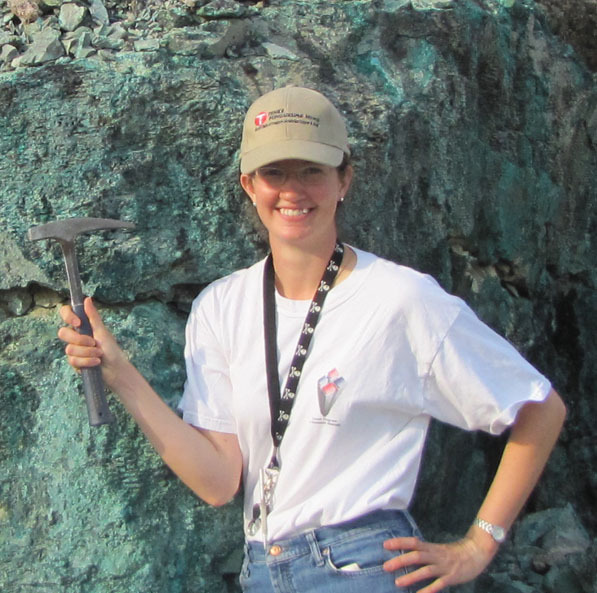 Instead, she has settled into a research and teaching position in applied mineralogy and geometallurgy with the University of Arizona's Lowell Institute for Mineral Resources. Isabel has worked closely with Freeport-McMoRan, who sponsored her dissertation on the Tenke-Fungurume project. She continues to collaborate with Freeport and other mining companies on projects ranging from a study of historical mining in Central Europe to developing a geometallurgy program at the U of A, to continuing research on the geology of the Central African Copperbelt, which is the topic of tonight's presentation. Isabel is a member of the AGS and SEG and a member of the AGS Executive Committee. In her free time she enjoys reading to expand her knowledge of geology, history, and philosophy.